HP is going back to the bottom of the alphabet with its latest line of displays and workstations. Designed for the professional set, the Z230 Workstation will be available in tower and small form factor (SFF) configurations. Folks in fields like finance, government, education and health care are the intended audience for the machines, HP said during a press call to announce the products. The gathered Pack-heads described the SFF variant as about 57 percent smaller in volume than the tower, making it ideal for less-spatially endowed work environments. It features four storage bays, three integrated DisplayPort outputs and two front USB 3.0 ports. Like its tower sibling, the SFF Z230 features a new Haswell version of the Intel Xeon processors and discrete graphics options. 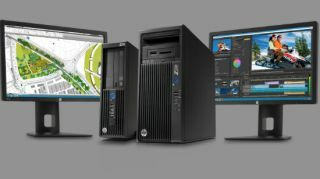 Both workstations are also intended to fill a two-year life cycle, which while seemingly quick is a first for HP. On the tower front, HP took a scalpel and chiseled down the chassis, allowing it to squeeze into a 4U rack. The tower Z230 features six drive bays, dual-entry 3D graphics support, four PCIe slots and one PCI slot. There's also an optional slim ODD bay for installing SSD hard drives, allowing for quick expansion. A USB 2.0 charging port on the front side is designed for tablet or smartphone juicing, HP said, along with 2x USB 3.0 ports. It along with the SFF have IO options and "highly flexible" storage options. The workstations are expected to be available worldwide next month, with a starting price for quad-core configurations of $999 (about £650, AU$1,081). What's a workstation without a monitor - you need to see what the heck you're doing, right? To meet this need, HP is pushing out the first of its Z series displays - the Z22i, Z23i and the marquee of the bunch, the Z24i. The displays are optimized to work with the Z230, so if you're looking for a display to pair with your tower or SFF, this would be the place to start. The displays all feature IPS Gen 2 panels, stepping over Gen 1 with ultra-wide viewing angles, lower power consumption (almost 26 percent more efficiency) and greater image accuracy. The Z22i is the baby of the bunch, featuring a 21.5-inch display at 1920 x 1080 resolution and a 16:9 aspect ratio. It houses a DisplayPort 1.2, DVI and VGA inputs, with an integrated 2-port USB 2.0 hub. The Z23i comes in at 23-inches, and has the same resolution, aspect ratio and ports. Like its fellow Zs, the 23i is primed for the sRGB color space, or the web's standard color space. The Z22i and Z23i offer 95 percent coverage, HP said, while the Z24i (see below) covers 99 percent. Lastly, the Z24i comes in at (can you guess?) 24-inches. This time around, the resolution is 1920 x 1200 with a 16:10 aspect ratio and 2/3MP. It's brighter than its smaller siblings and while the ports are essentially the same, the integrated USB 2.0 hub now has four ports. Its stand features HP's QR2 quick release tech, too. All three feature a four-way adjustable stand, and all are available internationally today, starting at $239 (about £155, AU$258), $259 (about £168, AU$280) and $399 (about £259, AU$432) in ascending order. Want a tablet to go along with your display and workstations? Check out the HP Slate 7.